Huntz Hall! One of the Greats,! Thanks for pointing him out, Ralph! Here he is with his buddy from the Bowery trying his hardest to get Flynn’s girl, Mr. Flynn that is. P. S. In addition to standing among those immortals on the Dodge City World Premier, he’s also, quite amazingly, standing among those immortals on the cover of Sgt. Pepper. But no lonely heart was he! No problema, Ralph! 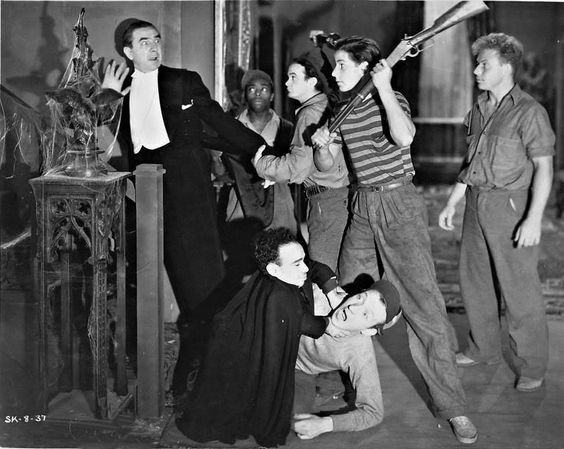 I’ve been a big fan of the Bowery Boys since I was a kid. It was worth it for me just to see the story of Mr. Flynn and his gorgeous girl at the Flynn Riding Academy. Somehow, I’m sure Errol inspired that little skit! Here they are taking care of some bloodsucking low-life from the Lower East Side.